Demantoid is the rarest of all the garnet varieties, and is valued for its exceptional dispersion and brilliance. This rare garnet was first discovered in the Ural Mountains in Russian in 1886, and was named demantoid for its diamond-like luster. It became a great favorite of European aristocracy in the late 19th century, but mining ended after the Bolshevik revolution in 1917. Demantoid mining in Russia has resumed in just the last 20 years. Though demantoid garnet has also been found in Namibia and Madagascar, the quality of the top Russian material is far superior. The African demantoid tends be yellowish green, olive green or brownish, due to higher concentrations of iron. The Russian demantoid is colored by chromium and tends to be a pure vivid green. 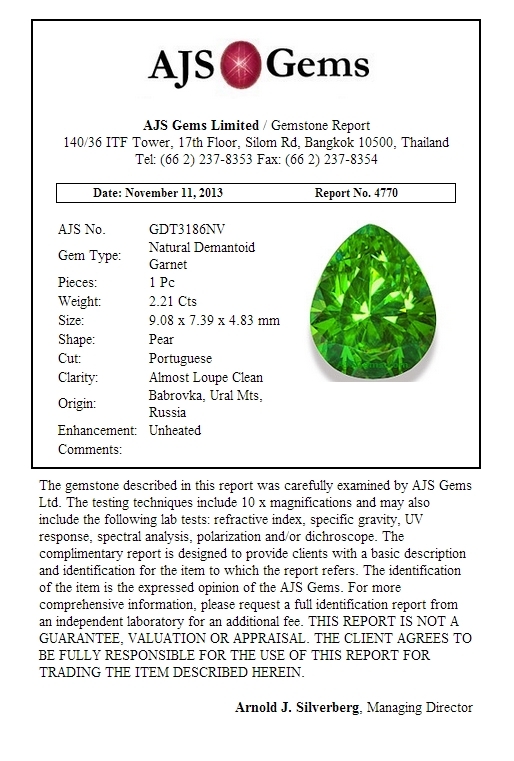 For serious gem investors only the Russian material is worth notice. 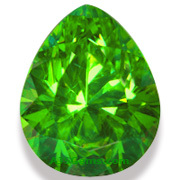 Demantoid garnet from any location is typically found in sizes under 1 carat. So larger gems are prized by collectors. The 2.21 ct demantoid shown here is an exceptional gem. It was found in one of the most famous Russian mines in Babrovka. This fine gem is exceptional in several respects, from its excellent saturation to its remarkable clarity and impressive size. Beautifully fashioned in a well-proportioned pear, this demantoid has all the fire and sparkle one expects from a top grade specimen. Though the gem is quite clean, a subtle horsetail inclusion is visible under magnification. This demantoid garnet is completely natural and untreated and was one of the finest specimens in our collection. It was sold to a private collector in October, 2013.